Always one to fiddle around with new flavors and cuisines, I stumbled upon a mouth-watering cabbage recipe in a book entitled The African Kitchen. I was immediately arrested by the simplicity, but bowled over by the flavor! According to the author, the recipe is popular in South Africa, Ethiopia, and Kenya. The onions and peppers provide an organic sweetness while the curry showcases the right spice element, without being overwhelming. Equally, I found this flavor profile would not be too off putting by loved ones who were not familiar with these ingredients. You know its one thing to like it yourself. However, when you are introduce a new dish to family; that’s a different story. However they were pleasingly surprised sounding off like firecrackers at first bite, “Mmmm,” the room echoed. After they gobbled down the first serving, they desired more of this “newfangled” cabbage dish. Slice or chop cabbage, onion and bell pepper. Heat oil in frying pan and sauté onion and bell pepper until onion is soft and translucent. Add the stock and cabbage, cover and cook until cabbage begins to wilt. Add tomatoes (and juice) and curry powder and cook for about 30 -45 minutes. Stir occasionally and add more stock if necessary to prevent sticking. Add salt and pepper to taste preference. 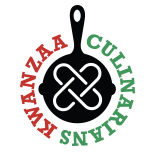 This entry was posted on December 31, 2014 by Kwanzaa Culinarians in 2014, Kuumba and tagged Cabbage, curry, John Burton Jr., kale, Kuumba, The Food Cravelogist, Zulu Cabbage.